Were you discouraged about missing the run-up in oil prices during 2018? Probably not anymore, now that a barrel of crude is back under $50 a barrel and most oil stocks are setting new 52-week lows. This recent decline has Wall Street losing faith in oil stocks and selling them indiscriminately. Fortunately for long-term investors, there are some great companies in this industry that are selling at great prices. 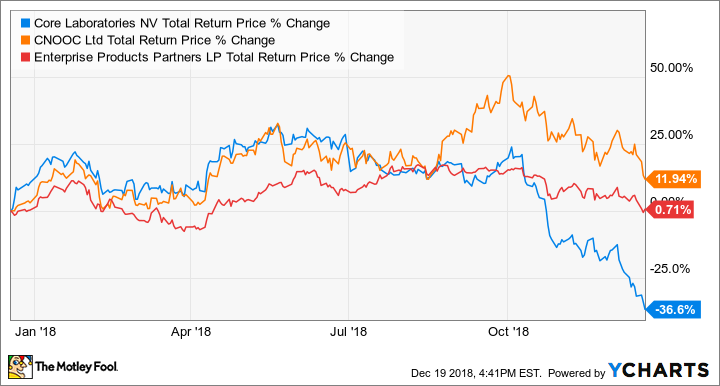 Here's why three of our Motley Fool contributors think you should take a look at Core Laboratories (NYSE:CLB), China National Offshore Oil Company (CNOOC) (NYSE:CEO), and Enterprise Products Partners (NYSE:EPD). Jason Hall (Core Laboratories): Oil prices have fallen sharply over the past few months, as global demand growth has slowed and global supplies have exceeded that demand. Furthermore, the production boom in the Permian Basin in the U.S. is running headlong into a lack of pipelines to get all that oil to market. Combined with continued weakness in offshore oil and gas development, and Mr. Market has firmly turned his back on Core Lab. That looks like an opportunity to this investor. As a matter of fact, I took advantage of the drop recently, more than doubling my personal investment in the reservoir description specialist. In short, Core Lab is built to continue generating solid cash flows even as the oil and gas market goes through big cyclical ups and downs. Most companies in the oil and gas industry have quite high fixed expenses because of the expensive, specialized equipment they must own and maintain, but Core Lab's business is built on intellectual property and its technical know-how, which makes it far easier for the company to ride out the oil market's swings while also maintaining very high profit margins even during market downturns. Lastly, the big sell-off has pushed Core Lab's dividend yield to 3.5%, and its cash flows are more than enough to support it. At current prices, Core Lab is an absolute steal, and the rare oil stock worth holding for the long term. Rich Smith (CNOOC): Last month, I recommended energy investors take a close look at Chinese oil major CNOOC as a potential energy investment. Now, I think oil investors, in particular, should give this one a second chance as well because as luck would have it, the price is lower now than it was then. Last month, with CNOOC trading for $163 and change, I pointed out how CNOOC's $5.4 billion in trailing free cash flow and resulting 13.5 price-to-free cash flow valuation made the stock look extremely attractive if CNOOC comes anywhere close to hitting analyst estimates of 33% long-term earnings growth. Since that recommendation, CNOOC has made a round trip in stock price, first gaining 6%, then losing it all. Today, the stock is actually about $1 cheaper than when I first recommended it. Granted, some may wonder if CNOOC can really grow quickly in the midst of a trade war with the U.S. Suffice it to say that I think it can. If deprived of trade with the U.S., China's going to have to rely increasingly on its own resources -- its own energy resources, in particular, which can only be good news for CNOOC. But in fact, I honestly don't think we'll need to test this thesis, because Chinese and U.S. negotiators are pushing hard to hammer out a trade truce within the next 80 or so days. If and when a deal is struck, I'd expect selling pressure on CNOOC to relent and for the stock to quickly recapture its gains of early December. With CNOOC stock priced so cheaply already, I see no good reason not to buy the stock today, before that has a chance to happen. CLB total return price data by YCharts. Tyler Crowe (Enterprise Products Partners): Enterprise Products Partners is one of those stocks where it's rarely a bad idea to buy it. The oil and gas pipeline and processing company has one of the nation's largest networks of crude oil, natural gas, and natural gas liquids pipes and other infrastructure elements such as petrochemical manufacturing facilities and export terminals. Also, it's largely insulated from commodity prices because it charges fixed fees to move or process these commodities rather than take a percentage of profit. Perhaps more important to investors, though, is that Enterprise Products Partners has a first-rate management team that has proven over time to be good stewards of shareholder capital, as evidenced by 21 consecutive years of increased payouts. Even more important than that streak is that it has done so while maintaining an investment-grade balance sheet and retaining lots of cash each quarter to grow the business. One of the reasons its stock is down recently is because management elected to temporarily slow the pace at which it grows its payout in order to plow more cash back into the business and capture the massive opportunity to expand America's oil and gas infrastructure. That decision, and the general sell-off in energy stocks, has pushed Enterprise Product's distribution yield to 7%. That is well above its historical average and a level we last saw during the recession in 2009. 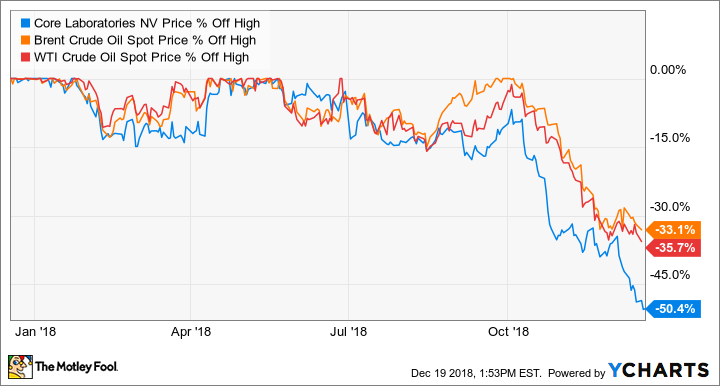 With a yield this high and incredibly lucrative prospects in the queue, Enterprise's stock is one investors should look at this month.